Wow! 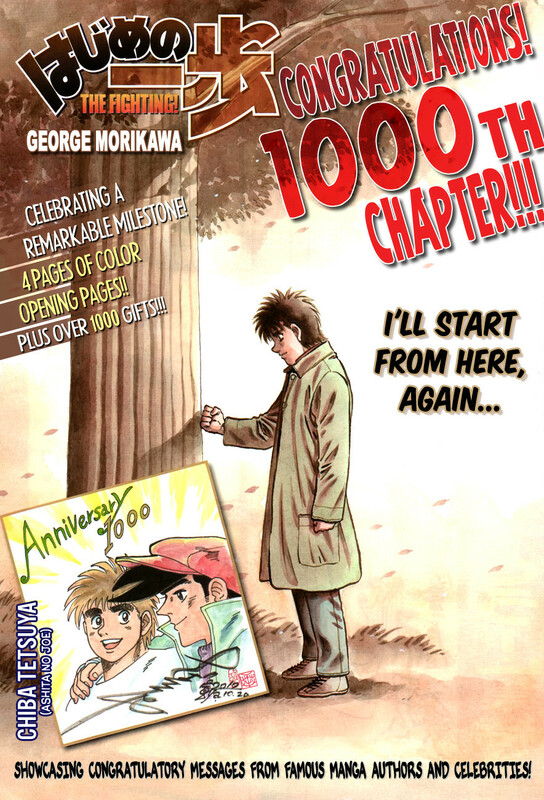 I didn't know Miura helped George Morikawa during college, it's really nice to see him draw Takamura. If you guys haven't watched or read Ippo you should check it out, despite being so long the beginning parts so far have been top tier. Oh Miura, humble as always. Nice to see Inoue getting a word in there, too! Most of the illustrations on both pages are great, but their contributions are obviously my favorites. Nice find. Miura's is by far the coolest tribute though. 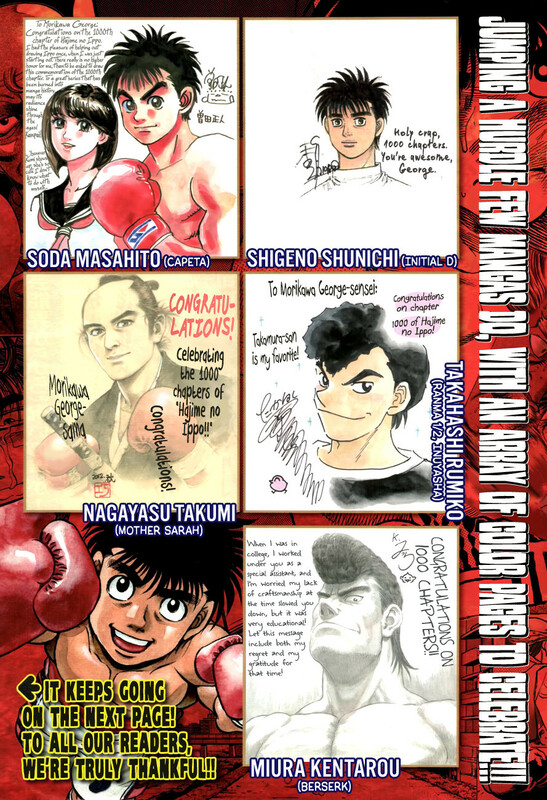 I've never read Hajime no Ippo, but it's always great to see such camaraderie among mangaka. Thanks for posting those. Miura's is by far my favorite, but as Walter said, it's heartwarming to see the camaraderie and mutual respect shown to one another by these ladies and gentlemen. Also... Takamuras right eye is not shown, maybe a little tribute to Guts??? I don't think so. I think it's just a really cool dramatic angle that he just happened to choose. Wow those tributes feel so powerful Obviously Im a sucker for Keisuke works and I like the approach with that comment. 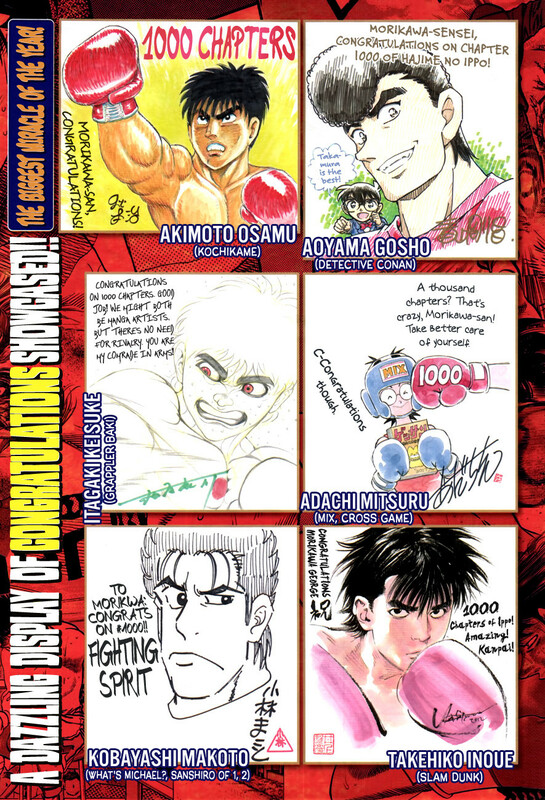 Havent read/watch Ippo yet but from what littled I´ve seen I can totally see if they´d feel a bit like kindred spirits. And yeah, Miura ever so humble, you can really feel the respect behind those words, such a cool dude! Thanks for sharing, Klink!